What can we learn from a Crash Test Dummy? Crash Test Dummies are not just for car commercials. They help us learn a lot about crashes BEFORE WE GET INTO ONE! Wouldn’t you like to have a “Crash Test Dummy for Caregivers”? Someone who will make all the mistakes before we do, so that we can be safer? GREAT NEWS. That “crash test dummy for caregivers” was on my show this Saturday. Peter Rosenberger is the founder of Caregivers With Hope. Peter has personally traveled the path of the family caregiver. In an unparalleled journey with his wife, Gracie, he has navigated a medical nightmare that has mushroomed to 78 operations, the amputation of both of Gracie’s legs, treatment by more than 60 doctors in 12 hospitals, 7 medical insurance companies, and $9 million in medical bills. In the process, he has learned that a caregiver cannot only survive, but thrive in the midst of oftentimes grim circumstances. Since 2013, he has carried his message of health and hope for the caregiver to the airwaves, hosting his own weekly show in Nashville. 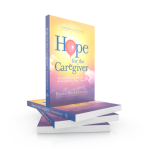 His latest book, Hope for the Caregiver (CLICK HERE or on the book cover) provides practical tools and encouragement for the caregiver. Peter calls himself the “Crash Test Dummy for Caregivers.” He wants to help us avoid making the same mistakes he has made.On Saturday, he is going to tell his story of caring for Gracie, and talk about the importance of maintaining balance and a sense of humor. This show will help you with practical advice and inspirational stories. The show is new. However, to accommodate Peter’s schedule, it has been pre-recorded.